new trends. These new trends could be seen as a better overall consideration of the role of food in human health or as misinformation related to some type of foods. For instance, lactose intolerance is often confused with cow’s milk allergy and avoidance of dairy is often considered the only alternative for the lactose intolerant. Dairy products contain lactose, a necessary substrate for our bodies. The total exclusion of dairy products is not recommended. Often people with lactose intolerance can tolerate dairy products by having them with meals, and better tolerate hard cheese and yogurts than milk. 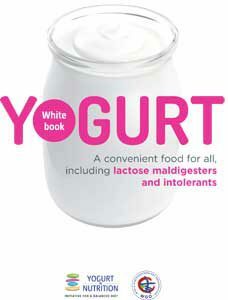 This white book, edited by a Yogurt in Nutrition working group, in collaboration with the WGO (World Gastroenterology Organization) is a review of scientific publications that brings a better understanding of lactose intolerance and the risks of a restrictive diet. Yogurt can be a good alternative, even for some lactose intolerant people.